How Do Golf Initiation Fees Work? Golf memberships typically allow full use of the clubhouse and golf course. A golf initiation fee is a one-time charge for joining a golf club. 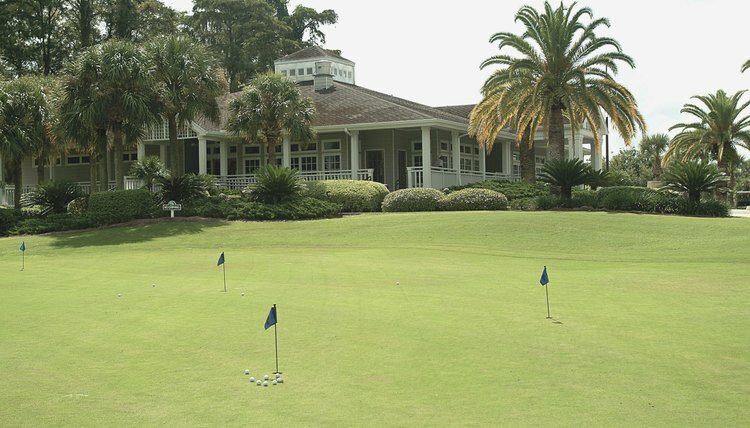 Many private country clubs charge initiation fees, although some clubs may waive the fee during special promotions. Initiation fees -- which sometimes are payable in installments -- vary according to the exclusivity of the club. As of the date of publication, the Golf Membership Spot indicated that initiation fees range from about $1,000 to more than $100,000. Clubs may offer equity memberships or non-equity memberships. Park Meadows Country Club, in Park City, Utah, is an example of a club that offers the former. An equity golf membership includes ownership interest in the club. Equity members have full voting rights on club issues. Non-equity members do not become owners and cannot vote on club matters. Initiation fees for clubs with equity memberships usually require a higher initiation fee than do those with non-equity memberships. According to the Golf Membership Spot, equity members may receive a refund of at least a portion of their membership fee upon leaving the club; however, there is not a standard guideline for how golf clubs manage initiation fees The Wall Street Journal's SmartMoney.com reported in 2009 that some golf clubs may not refund your initiation fee until they recruit at least one new member to replace you. Non-equity members are not usually eligible to receive refunds. SmartMoney.com asserts that it can take years to receive a refund of your initiation fee. It discusses one golf club that as of 2009 reportedly required eight new members to join before an exiting member could receive a refund of the initiation fee. Ratios may vary depending on the golf club and its bylaws. Some clubs may allow you to sell your membership to another person. Changes in the economy can affect initiation fees. A strong economy could increase demand for club memberships because some people may have more money to spend. Golf clubs may react to this by increasing initiation fees if the club reaches full capacity. When the economy is poor, clubs may lose members and respond by lowering initiation fees to attract replacements. "New York" magazine reported in 2012 that Donald Trump infuriated some members at his Trump International Golf Club in West Palm Beach, Florida, when he suddenly eliminated the $150,000 initiation fee through a promotional period and allowed people to join for free. Members who had paid the entire $150,000 voiced their displeasure, but Trump argued that the promotion worked because it attracted 70 new members. Ask lots of questions before joining any club requiring an initiation fee. The Golf Membership Spot asserts that you should carefully consider the overall financial obligation -- and not just the initiation fee. You will still be required to pay annual membership fees. And there may be other fees for bag storage and use of locker rooms, as well as mandatory service charges for wait staff and minimums in the restaurant. Also ask if the club has a history of annual operating assessments, which are sometimes necessary when a club's expenses for the year exceed income. When that happens, members may be subject to an assessment to cover the shortfall. An assessment could be for hundreds or even thousands of dollars, depending on the situation. Capital assessments are also possible if the club needs to improve the facilities or make major repairs. How Does an Equity Golf Membership Work? Can I Deduct My Golf Clubs as a Tax Expense? Do You Pay Membership Dues When You Are on the Waiting List at a Golf Club? Can You Get Married on a Golf Course? What Is the Difference Between a Municipal & a Public Golf Course?